01:24:707 - add circle here? I think that spot deserves to be clicked. 01:21:017 (5,1) - spacing might be a bit too far. Should at least reduce it to the same spacing as 01:18:450 (5,1) - The player stops moving at 01:20:856 (4,5) - cause they are stacked, but they are forced to moved really fast to 01:21:177 (1) - which could be tricky to play. 00:57:915 (6,1) - I would ctrl+g this rhythm to follow vocal better. the downbeat on the white tick is barely noticeable. 01:27:113 (3,1) - increase spacing? it's the strongest sound there and changing it would mak it so the ending doesn't feel anticlimatic. 00:19:894 (4) - this could be 2 circles instead of match the vocals, also to build a little more intensity. 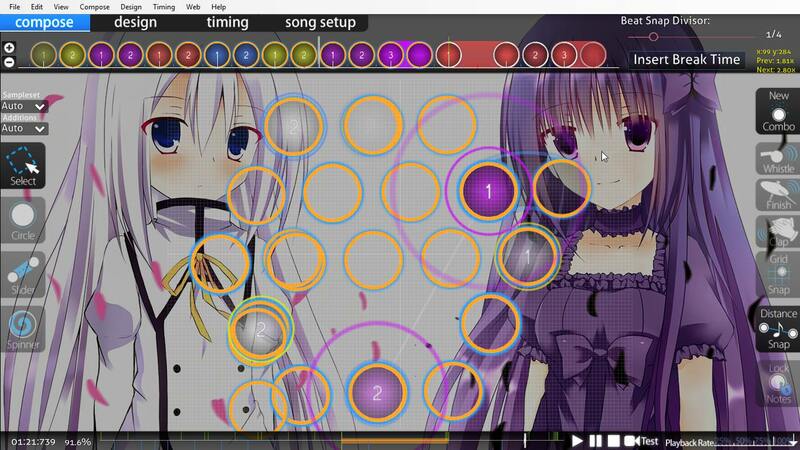 00:45:241 (1,2,3) - hmm not really liking how when i play here, the movement slows down really drastically. It would feel better if 00:45:241 (1) - is split into 2 1/2 sliders imo. 00:21:979 (4) - why sudden change to vocals.changed to vocals from 00:15:723 (1) - ...? 00:55:348 (5) - change this too for better flow if you do what i suggested above. If not, don't change thisyea, for emphasis. 00:14:600 (2) - something like this but cleaned up a bit might be nice https://osu.ppy.sh/ss/9506203 good suggeston, but don't want to change it. and 00:30:482 (6,7,8) - DS? 01:12:674 (2) - overlap looks messyhalf stacking looks good for me. 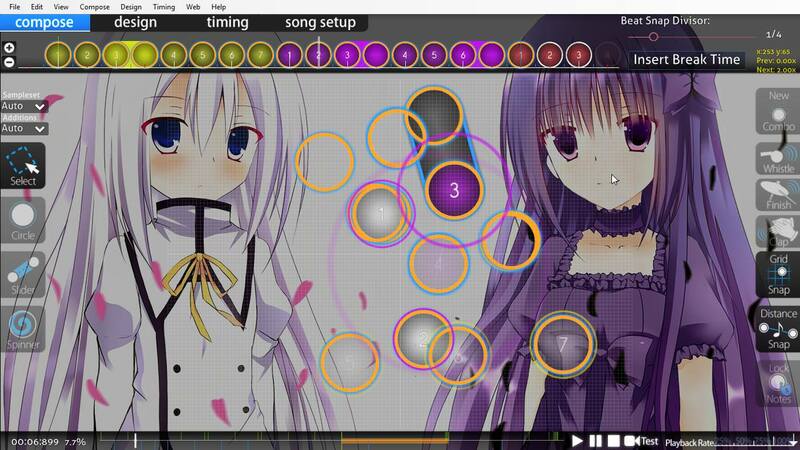 01:26:953 (5) - https://osu.ppy.sh/ss/9506223 better flow from 01:26:792 (4) - and leads into 01:27:273 (1) - I didn't use this slider, it can make weird patterns. 00:05:455 (1,2,3,4,5,6) - and 00:10:589 (1,2,3,4,5,6) - use perfect stacks for single jumps, but the other same patterns don't. Why the reading challenge only on these jumps?well, doesn't matter for reading imo. 01:24:707 - add circle here? I think that spot deserves to be clicked.wanna make empty in here. and need to be emphasized. 2017-11-11 17:07 IntellectualBoy: 바꾸기 힘들다 이거아님? 2017-11-11 17:16 IntellectualBoy: 그냥 일반적인 1/2 슬라쓴 이유는 머임? 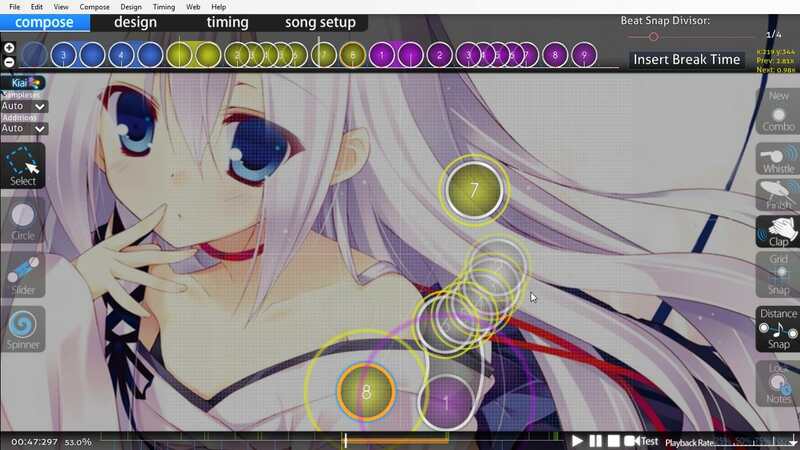 00:19:252 (1,2) - you are killing the flow too much here, and I felt bit >< when play. maybe move 00:19:412 (2) - to bit right (e.g. 349:23), 00:19:733 (3) - to bit left (281;97) ?? maybe move 00:57:755 (5) - to up (208:35?) ? btw, why does this diff not have a video like the other ones !? I'll be modding this map first, the rest look fairly agreeable. However, this one seems to be more problematic. 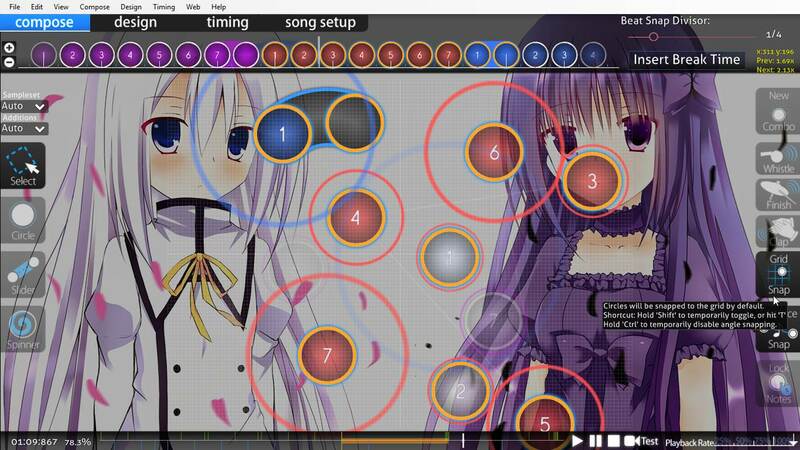 I didn't understand the rhythm on the core of the map 00:05:455 (1,2,3,4,5,6,7,1,2,3,4,5,6,7) - which repeats throughout the map. Yes, it is consistent, but I don't think it's the best rhythm choice to be consistent at all. It doesn't follow strictly drums, nor vocals nor the melody, it's just consistent, there are no differences between music layers. When mapping, clickable notes should represent the most important layer that you're following. The rest, less important notes, should most usually be made passive like sliderends so that a difference is made. 00:05:936 (4) - The biggest problem is probably this note being clickable. It doesn't have the high pitched melody, no drums, and no vocals (it has some deep guitar or piano tone, but it shouldn't be mapped like the rest since it's completely different) yet it is being mapped like the others. Making that note in a sliderend will make all others more emphasized. 00:06:418 (7) - This could be made into two circles to follow the melody which is going on 1/2 intervals. You can emphasize the new combo 00:06:739 (1) - if you want with spacing to make it more apparent. 00:07:701 (7) - This doesn't have the melodic sound on its sliderend, so it would make sense to make them different because in the song they're different. https://i.imgur.com/3K8NpIl.jpg so the rhythm in my ideal world should like this on these sound patterns. You can apply similar stuff to the intro section, with less dense rhythm, I'll let you decide on your own. If you want to follow vocals on parts where they are different like on this part 00:21:979 - ... You can make this into a slider 00:22:781 (5) - since the vocals are not on the red tick. I think you should consider that, since that sound pattern is different than the others that doesn't have vocals. 00:33:049 (5) - same applies here. 01:09:947 (3,4,5,6,7,1) - The vocals are going in 1/2 intervals here and are really intense, yet there is no change in spacing from this usual sound pattern. I strongly recommend scaling this a lot like https://i.imgur.com/FRMJzWF.jpg to better follow how intense the song is at this part, don't mind my aesthetics ;d.
01:14:760 (1,2,3,4,5,6,7,1) - Same goes to this, the music is different, more intense, yet it has no change in the map. I'll be modding this map first, the rest look fairly agreeable. However, this one seems to be more problematic. 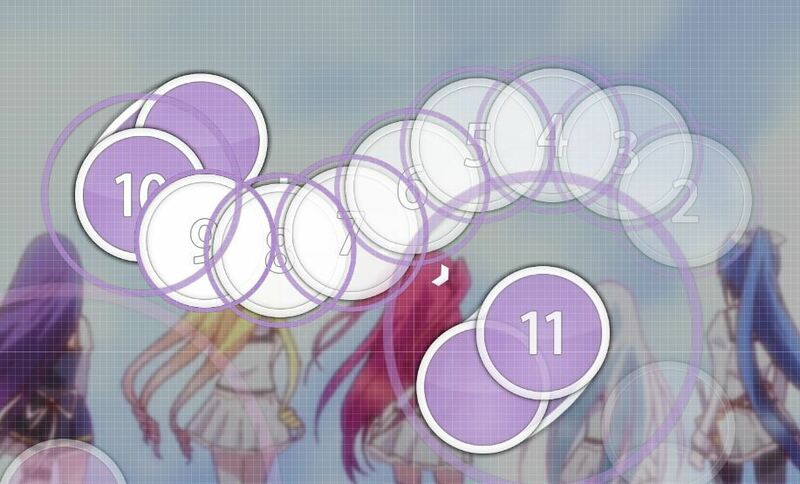 I didn't understand the rhythm on the core of the map 00:05:455 (1,2,3,4,5,6,7,1,2,3,4,5,6,7) - which repeats throughout the map. Yes, it is consistent, but I don't think it's the best rhythm choice to be consistent at all. It doesn't follow strictly drums, nor vocals nor the melody, it's just consistent, there are no differences between music layers. When mapping, clickable notes should represent the most important layer that you're following. The rest, less important notes, should most usually be made passive like sliderends so that a difference is made. Hard to change it and I don't wanted to make various pattens. 00:05:936 (4) - The biggest problem is probably this note being clickable. It doesn't have the high pitched melody, no drums, and no vocals (it has some deep guitar or piano tone, but it shouldn't be mapped like the rest since it's completely different) yet it is being mapped like the others. Making that note in a sliderend will make all others more emphasized. I followed downbeat rhythm and trumpet? sound. so this can be okay imo. if you think it is really weird, then I'll consider to fix. 00:06:418 (7) - This could be made into two circles to follow the melody which is going on 1/2 intervals. You can emphasize the new combo 00:06:739 (1) - if you want with spacing to make it more apparent. 00:07:701 (7) - This doesn't have the melodic sound on its sliderend, so it would make sense to make them different because in the song they're different. https://i.imgur.com/3K8NpIl.jpg so the rhythm in my ideal world should like this on these sound patterns. Similar as before, I want to make simple rhythm. and 00:06:578 - sound is not so strong. I think.